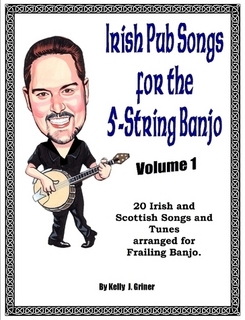 Another Pint founder, Kelly Griner has authored a book of Irish pub songs featuring 20 Irish and Scottish songs arranged and tabbed for frailing banjo. He even includes some arrangements in the keys of C and D to be played out of open G tuning. That's right, Kelly does not use a capo or retune when he is performing. Mad Angels is a collection of Larry Kirwan's plays. They range through subjects like the rock & roll (Liverpool Fantasy/Days of Rage), politics (Mister Parnell/Blood), and boxing (Night in the Garden). All the plays have been produced and the casts/directors/tech staffs/theatres are noted. The plays are all available for production and provide many stirring original monologues suitable for actors' auditions.